Sand Casting - The Three Types Of Casting Sand | Protocast Inc.
At Protocast Inc., we specialize in manufacturing prototypes and models for our clients — and there are many methods that we can use to do so. Among the common ways that we manufacture prototypes is sand casting. Whether you need to eliminate product design flaws, simulate your di-cast parts before investing in machining, or produce anywhere from one to 5,000 castings a year, Protocast Inc. is here to help. Most people think that they know a lot about sand casting from all of the viral YouTube videos that circulate around social media, but it is actually a rather complex process. For example, did you know that there are three different kinds of sand used in sand casting? 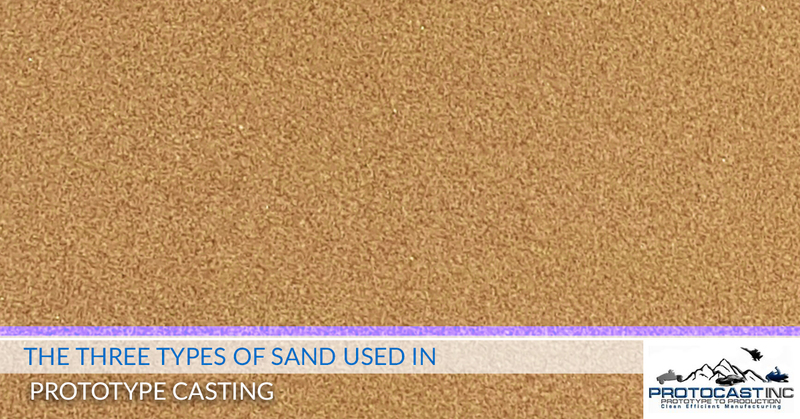 Do you know when each type of sand should be used, and why that particular type of sand is used? In today’s blog, we will be discussing the three different sand-types that are used in sand casting, as well as why, and when, the different types of sand are used. Refresher: What Is Sand Casting? Sand casting, better known as sand mold casting, is a technique used to make non-ferrous metal casts. The metals are heated until they become liquid and are then poured into the preformed sand cast. While this method of casting seems to be modern in nature, being that it is an extremely technical procedure, sand casting was invented nearly 6,000 years ago — and has simply undergone a number of modernizations since. Sand casting is a popular hobby for some people, but at Protocast Inc. we offer professional casting and prototype manufacturing to companies that wish to have their precision-made casts made in a professional setting. Green sand, sometimes referred to as clay, is wet sand that has been placed in a mold and packed down. The benefit of using green sand when casting is that the sand is in its uncured state when the metal is poured. One of the reasons that green sand is so commonly used is that the sand can be reused — making it an inexpensive alternative to other sand casting materials. While green sand is incredibly cheap to use, it can shift or collapse during the casting process due to the unstable nature of wet sand. That being said, the cost-effectiveness of this sand casting method is greater than the likelihood of the cast shifting — meaning that green sand casting is a favorable method of prototype creation and is likely going nowhere soon. Sodium silicate is another substance that is commonly used in casting. Sodium silicate is a unique substance because it can be changed from a liquid to a solid extremely fast when it is introduced to carbon dioxide. The largest benefit of using sodium silicate casting is that it works well with casting projects that require a cavity. While incredibly reliable, sodium silicate needs to be mixed with other materials in order to ensure that the cast can breakdown and the core can be removed. If the materials are not mixed, the cast will be rendered useless. Resin becomes solid with a smooth finish when it is heated. Because of this, using resin sand for castings can ensure that the cast surface remains flawless and free of imperfections. While resin sand is the material that produces the highest quality casts, it is known to be substantially more expensive and time consuming that green sand and sodium silicate. Silicate sand molds are most often used in situations where the cast must be absolutely perfect. For Sand Casting, Contact Us At Protocast Inc. If you are looking for a prototype foundry that specializes in manufacturing sand cast parts, we urge you to contact us today at Protocast Inc. Located in Commerce City, Colorado, Protocast Inc. has been helping companies produce high-quality sand castings since 1995. If you are in need of a prototype with no design or manufacturing flaws we urge you to contact us today. We look forward to helping you optimize your prototypes. So contact us today and tell us what project you need completed. Then schedule an appointment with us and we will do the rest!